Budapest is nicknamed the "Paris of the East" for many reasons; one of these is the river that runs through it. Like the Seine flowing through Paris, the Danube cuts through the middle of the city, curving and winding under bridges and around little islands. We decide to meet my parents, who will be on a vacation in Greece, in Budapest. The only problem is that Bucharest, which sounds so similar, is also nicknamed the "Paris of the East". This means that after I quintuple check my tickets (did I really book Budapest? Or Bucharest?! ), I still jolt straight up in bed, wide-eyed, thinking, "I need to check that again." It's giving me Obsessive Compulsive Disorder. Did I book the hotel in the correct city? Did I book my parents' flight into the right country?! Don't worry; we all end up in the same place -- in the Paris of the East, that is. I can't tell you which city deserves the title more, because I haven't been to Bucharest. But I can tell you that, for the most part, Budapest does a good job. But it's still not Paris. For example, Budapest has its world-famous Opera building (which, in my opinion, doesn't hold a candle to Paris' Opera Garnier). Instead of City Hall (Hotel de Ville), they've got the absolutely stunning Parliament, built around the same era (end of the 19th, turn of the 20th century). It's a city that mixes classic architecture with some ugly Soviet-era blocks and also modern buildings. Budapest's beautiful church -- St. Matthias and the Fishermans' Bastion -- is not as massive as Notre Dame, but it's certainly more colorful. It's like a fairy tale fantasy castle, with the Bastion as a charming "little" garden gazebo. Even Pippa, our most church-weary child oohs and aahs at ever corner and admits she'd love to live in here. Coincidentally, it's official name is actually Notre-Dame-de-l'Assomption de Budavár, though everybody just calls is St. Matthias. Their metro system (officially the first underground metro in Europe), and some of their cars, are so small and cute. On the other hand, it's actually easier to get a taxi to take four people in Budapest than it is in Paris (where three passengers is the usual legal and practical maximum). They've got their bistros and their pastries, which tend to be more of the strudel-y variety. Besides the most famous dish, Hungarian Gulash, there's also chicken paprika, stuffed cabbage, and some other things we never get around to trying, including Chopped Pork Knuckles and Rooster Testicles Stew. Budapest is, thanks to the Danube running through it, a city of bridges, much like Paris. It's also a City of Lights (and yes, I know that Paris was supposed to be the City of Light, as in "enlightenment", but nowadays the nickname seems to refer more to the electric variety and their lovely reflections in the Seine). There's an important Jewish section in Budapest. In Paris, that's the Marais just outside my door. And, of course, that means that there's also a significant and sad World War II Holocaust story -- in Budapest's case, with even more disastrous results than in Paris (in Hungary, 75% of the country's Jews were killed in the Death Camps). There are several memorials, including this very touching group of bronze shoes, placed along the Danube. We don't do as well with the language here as we do in France and are certainly butchering every street name. On the other hand, the Hungarians are not always getting their English right either. ...oh-so-fashionable warm hats, and even the unique style of this street performer. The instrument he's playing has a piercing, haunting sound that seems like a combination of bagpipes and a hurdy-gurdy. London has a river that runs through it, too, but you never hear anybody referring to that as the Paris of the West. But it's not just about the Danube; there is something about Budapest that does suggest the nickname Paris of the East. Being there makes me think hard about what it is that makes Paris so Parisian, and what a tourist sees here as its defining characteristics. Camembert Pomcalva, a specialty cheese crafted by Laurent Dubois for his shops is a rich, butter, raw cows' milk Camembert laced with a center layer of cream with apples marinated in Calvados. You get your cheese, fruit, and wine all in one bite. It's heavenly. This cheese screams of the terroire of Calvados, in Haute-Normandie. Not only is this the home of many cows, and of Camembert cheese, it's also the source of the country's apples, and of the world's Calvados, an apple brandy. Orchards and brewers in the area are first mentioned by Charlemagne, in the 8th century, and a local business in hard cider and, eventually, apple brandy gradually evolved in the region. In the late 1800s, a fungus destroyed much of the grape crops in all of Europe, and Calvados became very popular and well-known at that point. It's now made from over 200 varieties of apples, fermented into a cider, then aged for at least two years in oak casks. It is said that the longer it ages, the mellower it becomes, so I suppose I'd really enjoy a neat glass of it after about 1,000 years. The apples are soft and powerful, like apple pie filling that's been trapped inside a jug of sangria. And the cheese -- well, it almost goes with saying, since it's a high quality Camembert: buttery, creamy, oozy, unctuous, silky, heavenly. Budapest is a composite name, made up of the villages on both sides of the Danube river: Buda and Pest. Frankly, there's no reason it has to be Budapest; it could just as easily have been named Pestbuda (look carefully at the photo below, the sign at the right edge in the foreground). In that vein, Pomcalva is a composite name made up of "pommes" (apples) and "Calvados" (apple brandy), both of which appear in and on the cheese. It could have been called Calvapom instead, but it just sounds better this way. 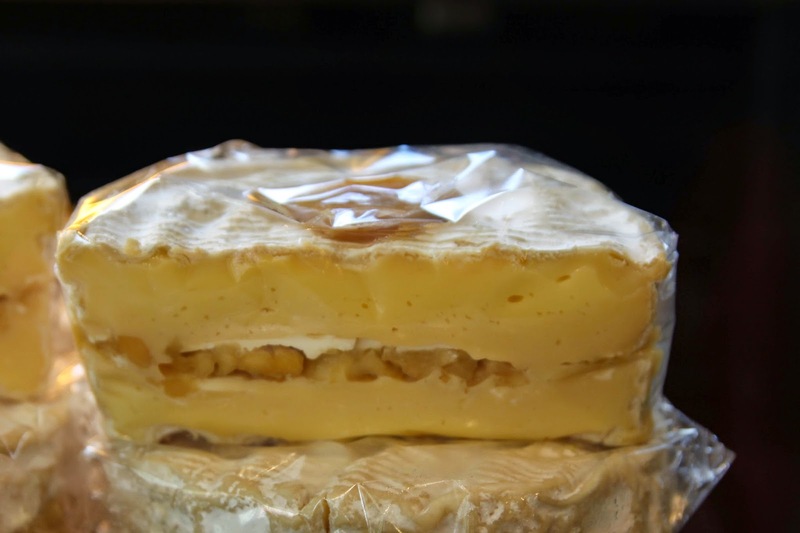 And speaking of veins, a river of apples, cream, and brandy runs through this delicious, creamy Camembert, just like a river runs through not only real Paris, but all the other "Parises" as well.